Always use this medicine exactly as instructed by the doctor. Please read the patient information leaflet before starting this medicine. 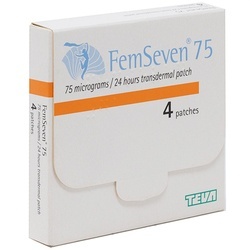 One FemSeven sequi patch should be applied once each week to a clean, dry, unbroken, non-irritated area of skin below the waist, preferably on the buttock or hip. You use the phase one patches for the first two weeks and the phase two patches for the second two weeks of each monthly cycle.Each patch should be worn continuously for seven days and then replaced. Each fresh patch should be applied to a slightly different area to avoid irritating the skin. Leave at least a week before applying a patch to the same site. Full instructions on how to apply the patches in the patient information leaflet. 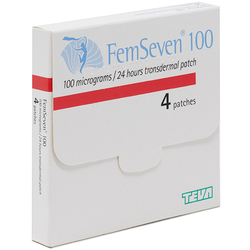 The active ingredients in Femseven Sequi (Estradiol/Levonorgestrel) Patches 12 are Estradiol 1.5mg and Levonorgestrel 1.5mg. The inactive ingredients are Transparent Polyethylene Terephthalate (PET) foil (Backing layer & Protective Liner). Styrene-isoprene-styrene Block Copolymer, Glecerine esters of completely hyrogenated resins (Adhesive Matrix). 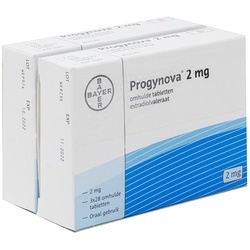 Like all medicines, this product can cause side effects although not everyone experiences them. If you experience any of the side effects listed in the patient information leaflet or not listed in the leaflet please consult your doctor or pharmacist. 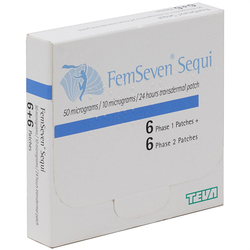 You should not use Femseven Sequi if you are pregnant or breastfeeding. Please give your a doctor a full medical history to ensure the appropriate medication is prescribed.